The School Nutrition Services department works to provide a variety of healthy and appetizing food options to over 7,000 KCS students and employees each day. Tasked with implementing and meeting USDA guidelines in all meal selections, SNS staff are continually seeking ways to increase service and food choices to meet individual needs and tastes. During the 2016-17 school year, almost one million meals were served in KCS cafeterias! At the same time, a student-led initiative to reduce the waste of unopened food was continued, giving students the option to donate food items to classmates and/or families in need. Along with providing the best possible food options, School Nutrition Services works to maintain the safest and healthiest dietary environments. All KCS schools are inspected two times a year by the Tennessee Department of Health. During the 2016 fall semester, all schools scored a perfect 100 during health inspections! All but one school (which scored a 98) received a score of 100 during the spring semester health inspections! During the summer of 2017, 3,775 breakfasts, 22,589 lunches, and 17,718 snacks were distributed free of charge through the Summer Feeding Program. This represented an increase of 3,106 additional meals and snacks over the previous year while operating six fewer days! 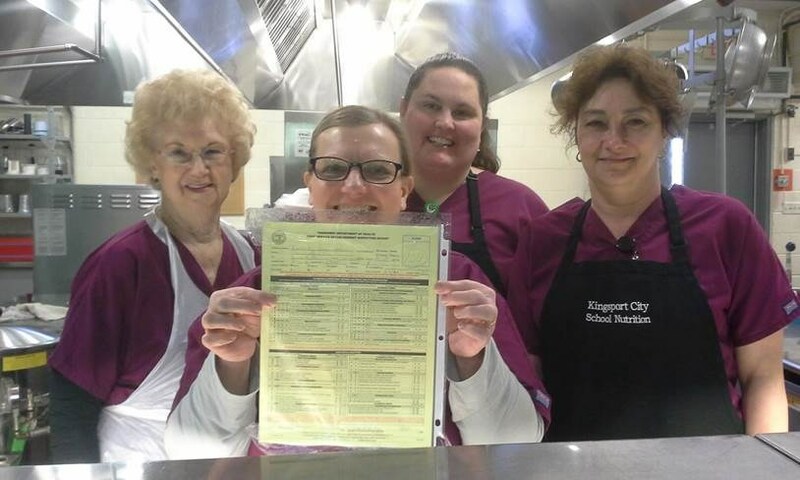 This unique opportunity was provided at 17 different sites across Kingsport, supporting multiple community agencies, and was yet another way that the KCS School Nutritional Services staff strives to better the health and nutrition of Kingsport’s children. In the summer of 2016 school year, SNS sought school board approval for a new federal program called Community Eligibility Provision (CEP). Under CEP, six schools in our district (Lincoln Elementary, Johnson Elementary, Kennedy Elementary, Jackson Elementary, Roosevelt Elementary and Sevier Middle School) are eligible to provide no cost breakfast and lunch meals to students regardless of family income. This program was a huge success and CEP will continue at these schools for the fall and spring semesters of 2017 – 18 school year as well. Now more students have the opportunity to receive a healthy meal so they can learn each day.